Rep. Steve King, R-Iowa, says the unconstitutional granting of amnesty to millions of illegal immigrants is one promise President Obama actually intends to keep, and he says the Republican Congress must be ready to do what it takes to stop it from happening. The day after major Republican wins in the midterm elections, Obama reiterated his vow to act alone on immigration policy. On Wednesday, he told the nation he would announce a major immigration executive action in a prime-time speech Thursday at 8 p.m. EST. While not detailing what his executive orders would entail, reports have indicated that the centerpiece of Obama’s initiative would grant legal status and issue work permits to the parents of U.S. citizens and children already legalized in some way. Estimates suggest that would legalize anywhere from 4.5 to 6 million illegal immigrants. While immigration has been a divisive issue among Republicans over the past couple of years, King said GOP lawmakers are virtually unanimous in fighting what they see as an unconstitutional power grab. He’s less certain Republicans are willing to to whatever it takes to win the fight. King has been a leading voice of opposition to granting legal status to people in the country illegally. He said he can remember where he was and the disappointment he felt when President Ronald Reagan signed the 1986 amnesty into law. The congressman said Obama’s agenda is infinitely worse, and he fears the president is dead set on taking action on his own. “The president has a very long string of broken promises, but this, I think, is going to be the promise he actually keeps. He is poised to violate the Constitution and create his own immigration law out of thin air. He has no constitutional authority to do this,” said King, who believes Obama’s insistence on this issue boils down to one thing. “He thinks a high percentage of them are just undocumented Democrats, and the next phase would be to document them so that they can vote,” he said. How does King conclude the president’s actions would be unconstitutional? “Not only does Article I set aside all legislative power to the United States Congress, but also an enumerated power is to provide a uniform rule of naturalization. That’s Congress’ authority, and there are multiple court cases that identify that Congress sets immigration policy,” said King, who argued Obama has already flagrantly violated his authority on other decisions on immigration policy. Obama defenders accuse critics of the impending executive orders of employing selective outrage. They say many previous presidents have effectively removed the threat of deportation for some illegal immigrants. King admitted there is some legal discretion granted to the president on immigration matters, but he said Obama’s apparent course of action takes things to a completely different level. King suggested America’s very system of government is at stake in this debate. “What he’s poised to do is step up in front of a press conference someday in the near future, take the Constitution, separate out Article I, the legislative authority (and) all the things that set up the United States Congress, look at us all and tear Article I out of the Constitution, fold it up, put it in his shirt pocket and say, ‘I’m also the legislative branch of government.’ That’s what he’s doing,” King said. “This is a constitutional crisis that is hanging over our heads like the Sword of Damocles. Congress must block this president. It is our duty to do so,” he said. So what will the Republicans do to stop it? One thing House and Senate GOP leaders have ruled out is any sort of government funding showdown. That’s a promise King wishes they hadn’t made. King isn’t eager for another showdown over appropriations, but he also isn’t very impressed by some of the ideas floated by GOP leaders, either. One is simply to extend current funding levels in all areas of government until the end of the fiscal year on Sept. 30, 2015. “That would give all the funding to the president and would take away our tool to restrain him by cutting off the funding to implement or enforce his unconstitutional act,” King said. Another possibility is passing government funding at existing levels but revisiting funding for immigration enforcement in the new Congress and taking it out through a process known as recision. King has already drafted a bill that would automatically cut out funding for unconstitutional immigration actions by the president, both past and future. Beyond that, King is ready for whatever it takes to win the political fight. 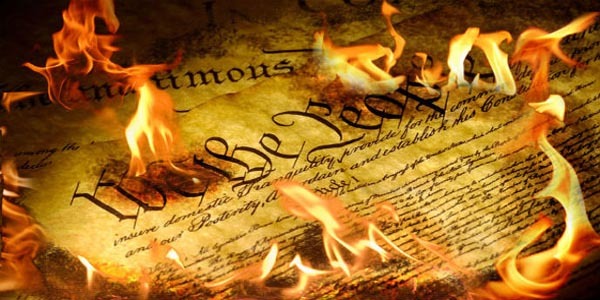 The congressman stressed again the fight over executive authority versus enumerated powers for the Congress will determine the fate of America’s form of government.